In ecam is possible define several stock materials. The purpose of having several stock material is to give the possibility to save different tool cut-data for the same tool. then click [EDIT STOCK MATERIALS] from tool table. 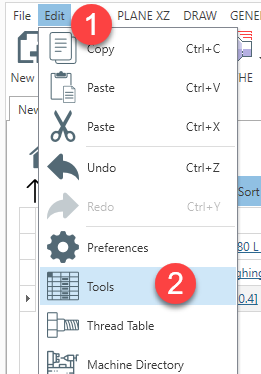 The button is available only when you open tool window from menu. 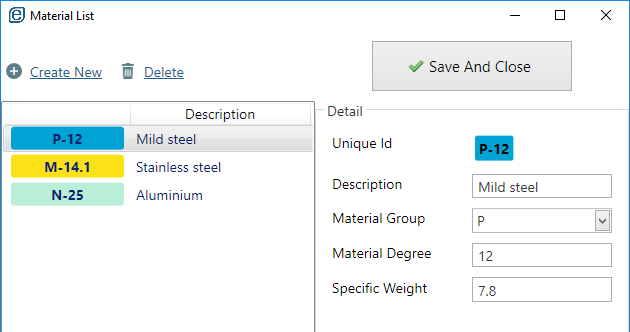 Below the MATERIAL LIST window. Create New : Add a new material to the list. See below the properties you need to edit. Delete : It delete permanently selected material. It not suggested delete materials after using it in some project. Unique Id : This is an auto-calculated property. It's the combination of [Material Group] and [Material Grade] properties. 1) Is important have a different unique id for each material. This property is used to retrive the cutting data parameters related to the material. 2) Don't change this id from existing material , since you are going to lose all the referenced cutting data . Description : This is the description you are going to see in home treeview or in combobox in the tool store dialog. Material Grade : For the same material group you can have different material grades. Insert the value in this field. Material Group and Grades are used from tool builder to classificate the various material of component part. Here and here , some tools website with more information about this classification. Specific Weight : Right now this property it's not used from the software. It's planned a method to give to the user the weight of the stock. So it will come in handy in the future.